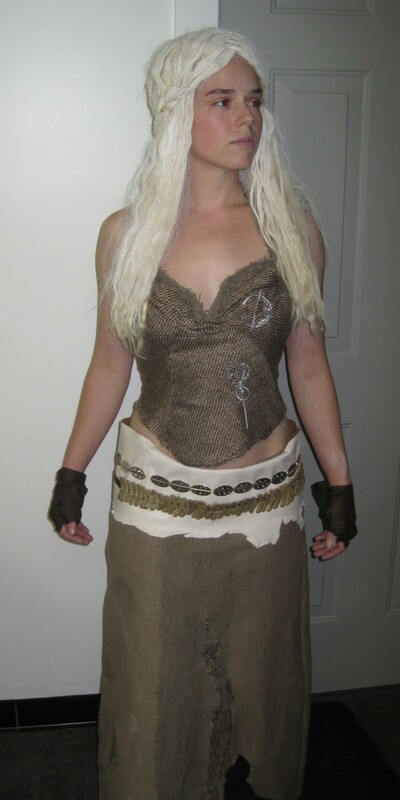 Home / Costume Articles / Game of Thrones Costumes / My Daenerys Targaryen Costume for Dragon*Con! Please click here for purchasing info, Queen of the Horselords. 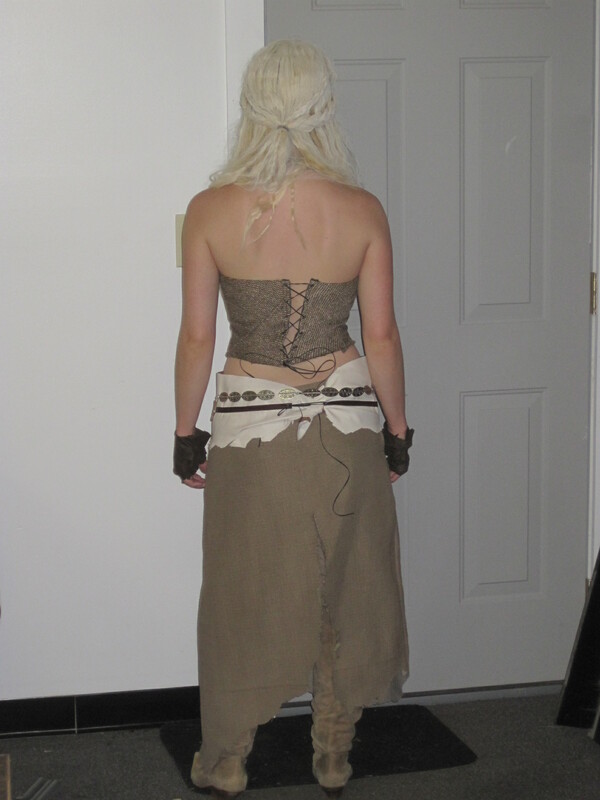 This is my Daenerys Targaryen Costume from the series A Game of Thrones. It was adapted to TV from George R. R. Martin’s first book A Song of Fire and Ice. 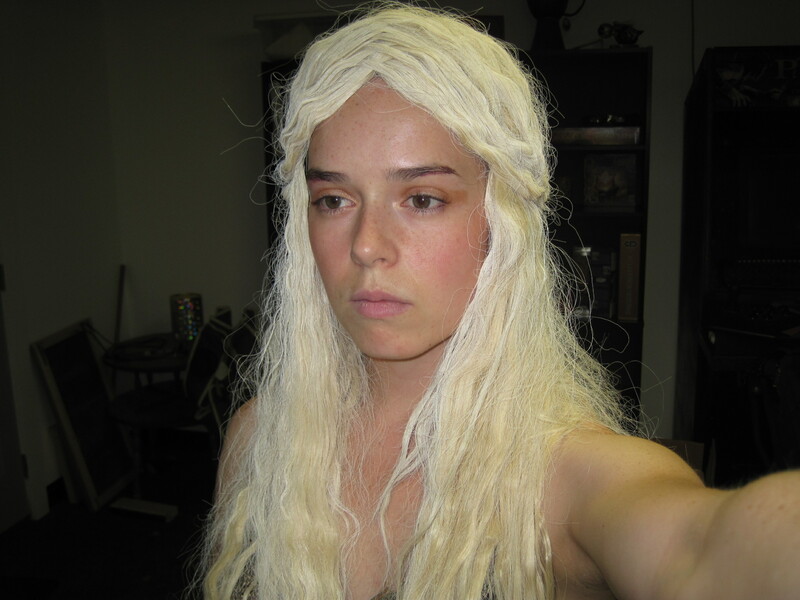 I first started this costume with Khaleesi’s wig, since that is the most important part. I went to my local wig supply store and purchased 3 packages of 18 inch synthetic fiber platinum blonde hair. I then found and old wig that I could re-purpose the cap and sew the new tracks of hair to. This was quite a long and painstaking process, even on the sewing machine! So Khal Drogo better appreciate every minute I spent making my hair perfect darnit! Anyhow, after I sewed the tracks on, I had to figure out how I was going to finish the very top, since I have no idea how to make a skin top for a wig. I ended up hot-gluing small sections of the tracks in an overlapping zig-zag pattern to hide the center scalp line. I then crimped the hair to give it wave and sprayed white hair color for the final effect. The only thing I would do differently for Daenery’s wig next time would be to not sew the tracks completely on all the way around. This ended up making the cap very small and tight. You are really only supposed to sew it on at two or three spots around the cap so it still has stretch. TOP- I found this fabric at my local Hancock Fabrics for $4.99 per yard on the upholstery remnants table. I bought 1 yard. I adjusted my dressform to my size and draped the fabric directly on to the form in the shape of Daenerys’ top. I hand-stitched some of the pieces together while it was on the form, and bunched the fabric around the bust-line and tacked it into place. I reinforced everything on the sewing machine after I took it off of the form. As for the weathering, I took watered down grayish-brown acrylic paint and brushed it up and down directly on the fabric with a fan brush. I then took some sandpaper and sanded the edges to make it fray a little. It does not actually close with the pin. I decided to have it lace up the back since the pin I made is just for decoration. I cut out two small strips of leather to back the top where the eyelets would be inserted for reinforcement. If I hadn’t done this, the leather eyelets may have fallen out. 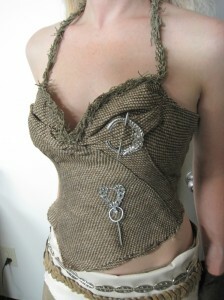 I tried on the bodice and measured out how long the strap would need to be for the halter part. Once that was sewn on, I hand-sewed a small strip of the fishing net to the strap for extra texture, which is always important to consider when making any costume. SKIRT- I also found this fabric at Hancock Fabrics on the same remnant table as the top. I didn’t use a pattern to cut this skirt, so I basically measured my waist and cut out a front and back section to be sewn together. I then added a hidden zipped to the side. While I was wearing the skirt, which was probably kind of dangerous, I slit it up the front and back with a serrated knife. I also made it shorter with that same knife. I thought this would give it a more authentic look. I cut out a hole in the front for wear and tear and used the same weathering method I used for the top. As for the fishing net Daenery’s has hanging down the front, I found it for $6.99 at Hobby Lobby. I just used a small portion and tacked it to the skirt. I also cut it up a bit and made some of the holes bigger. The faux leather white wrap around the skirt was also found at Hancock Fabrics. I weathered it in the same way as everything else. I originally had it tie in the back, but ultimately decided to shorten it and have it lace up for a cleaner look. I also hot-glued down the top edge to make it look finished without having a seam line there. BOOTS- As you can see in the photo the boots are quite pointy, which I was not satisfied with. They are Nine West suede boots that I ended up hacking off the tip and refinishing the front to make it soft and round. 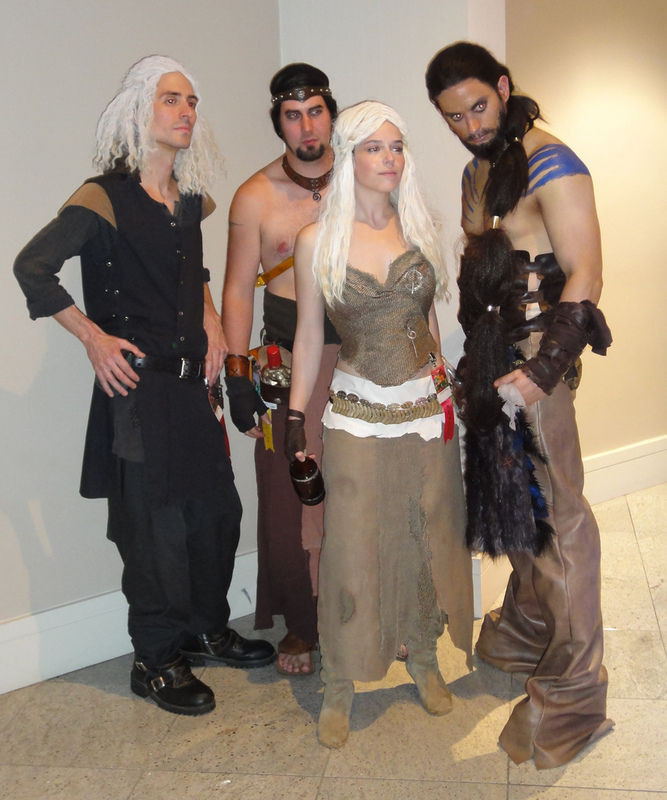 You can see this in the photo from Dragon*Con with the Game of Thrones group. I would not recommend trying to modify your own boots, simply because it was very hard and I ended up making them too short by accident and they were very uncomfortable to wear. PANTS- I found a stretchy pair of khaki-colored pants from the thrift store. I cut off the very top because they were pretty high-waisted and I sewed them in to be much tighter. Whatever kind of fabric they used to make those pants, it looks a little like suede, it was perfect for the look I was trying to achieve my Khaleesi cosplay costume! BELTS- The top belt was put together with pieces I found in the bead section of Hobby Lobby. I can’t remember the brand, but they just happened to be 50% off when I bought them! I had the hardest time finding pieces for the lower belt, so I decided to make them myself! I hand-sculpted the beads from super sculpy and a glued them to a strip of leather. I then painted them with acrylic paint. PINS- My pins are made from different pieces of Dollar General $1.00 earrings that I cut up and super-glued together. They were pretty easy to cut since the material was super flimsy. I used a giant needle for the middle part of the top pin and then sewed it on by hand. the lower pin was made the same way, I just used a bit of heavy-gauge wire for the long piece and the loop. After they were made, I used a silver rub to brush the tops of the pins so they would match. GLOVES- I used some brown faux leather to make the Khaleesi gloves. I cut out the plain glove shape minus the fingers and sewed it together. 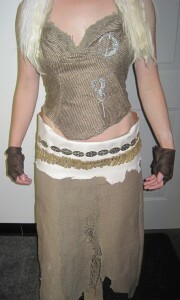 I then cut out additional strips to wrap around the glove to give it the same wrapped look as Daenerys’ gloves. I believe that covers just about everything! I will post the pictures below of my costume as well as a photo from Dragon*Con. In the Dragon*Con group photo we have Michael Bielaczyc as a horse lord, Josh Harper as Viserys, and a Khal Drog that we met up with, whose name I can’t remember. In case you are wondering about the Viserys wig, I bought it at a local wig supply shop and sprayed it with the same white hair spray that I used on mine! Thanks for reading and enjoy! This costume is based on my Queen of the Horselord’s Dress. If you would like to commission this costume for yourself, email us at sales@aradani.com .